The big question: How do we make digital books as satisfying as their print predecessors? 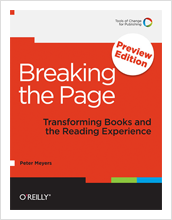 I’m thrilled to announce the release of the preview edition of “Breaking the Page: Transforming Books and the Reading Experience” (available through the iBookstore, Amazon and O’Reilly). In this free download, I tackle one big-ticket question: how do we make digital books as satisfying as their print predecessors? The preview edition’s three chapters focus on some basics: browsing, searching, and navigating. This ain’t the sexiest crew, I know, but it’s amazing how hard it is to get this stuff right. I focus on examples good and bad, toss in a few design ideas of my own, and suggest how to include these services in a way that makes digital books pleasing on eyes, hands, and minds. What’s the best way to integrate — and not just add — different media types? And, on a related note: is it possible to make the viewing experience as seamless and immersive as reading is in print? How do you design content and reading paths on what is, essentially, an infinite canvas? How do you pick the best balance between personalized design (reader-controllable font sizing, for example) and author-driven fixed layout? Are there any acceptable compromises? While I’m pushing ahead to the finish line, I’d love to hear what you think. Suggestions, examples, critiques … send ’em all my way.